"Twins and lovers, halves and doubles, echoes and refrains, diptychs and couplets: thus we see our world reflected and refracted in all of its complexity in John Medeiros' stunning new collection. 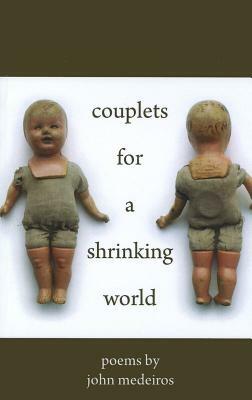 couplets for a shrinking world brilliantly displays how the best poetry is always two things at once, both gorgeously musical and painfully taut, imperfect bodies mirrored in liberated souls, voices divided by conflicted feeling and yet ultimately joined in a singular and empathetic wisdom." --Rafael Campo, author of The Other Man Was Me, The Enemy, and What the Body Told.